The Sagittarius and Scorpio love compatibility in a romantic relationship will need to slow down and take the time to learn about each other. They will each need to learn about each other on a deeper, more significant level. Otherwise, they might find they are way ahead of the relationship. The Sagittarius Scorpio relationship could be over before it even has a chance to start if they are not careful. If they can have patience, it will definitely be rewarded. The Sagittarius zodiac is happiest with variety. They love new and exciting things. They will be the ones to realize the power of optimistic thought. At the same time, Scorpio star sign will just want to be more intimate with their partner. They will want to make their emotional bonds even stronger. When the Sagittarius and Scorpio friendship is established, the archer might feel restricted by the scorpion. The Scorpio man or Scorpio woman will give them a lot of attention and have high expectations for a romance. They will need to control their emotions. If they can, the Sagittarius and Scorpio marriage will be satisfying and exciting. The planet Jupiter rules over Sagittarius. The planet Pluto and planet Mars rule over Scorpio. Mars is the god of war. The influence of Mars will give Scorpio personality their motivated, brave nature. When Mars is mixed with Pluto they represent rebirth and renewal. Jupiter concentrates on education, higher learning, positivity, luck, and travel. The traits of growth, expansion, and male energy from the planets will mix to make a sustainable Sagittarius Scorpio compatibility. They will have a lot of respect for each other. Sagittarius is a Fire sign. The archer will be the one to be impulsive. They will take whatever direction they want on a whim. Scorpio is a Water sign. Their ambitions will be more subdued and less easy to read. They might not understand each other’s motivations or they might misinterpret them. However, this does not mean the Sagittarius Scorpio soul mates will fight. They will both need to agree that their relationship is significant. If they can do this, their loyalty and affection will get them through any fights. The best thing Sagittarius and Scorpio love compatibility is the security and flexibility they can give each other. They will be very open with each other. They will be able to learn to appreciate each other’s different philosophies in love and in life. They can have a steamy relationship, with deep bonds and genuine respect. They will both need to communicate and celebrate their differences. The Sagittarius and Scorpio relationship will be passionate. The archer is a fire sign and the scorpion is a water sign. Because of this, the Sagittarius and Scorpio in bed will have a hot and steamy relationship. However, they have very different views on life. This might make it hard to have a successful relationship. Sagittarius is the adventurer of the zodiac. Scorpio is the sorcerer of the zodiac. They will both want different things from life. However, if they are in love, they might be able to compromise. Sagittarius and Scorpio both have strong personalities. They find each other intriguing but they might not know why. The sorcerer will be attracted to the fiery and charming nature of the adventurer. The adventurer is attracted to the quiet, brooding, mysterious nature of the sorcerer. They will both see a sense of danger in each other. At the same time, they are both willing to try their luck. Sagittarius and Scorpio being compatible in love will be somewhat like a test of wills. It might be a battle of emotional depth over excitement. It might be a fight of vitality over power. The archer and the scorpion will be more zodiacally compatible with each other when they sense a challenge. 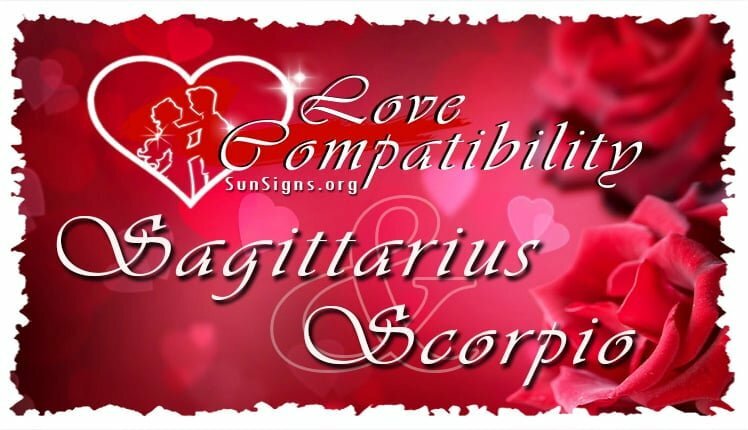 In this Sagittarius and Scorpio compatibility, both will bring a lot of passion to the relationship. Sagittarius personality has a passion for life, with a nature that is fiery and open with a lot of energy. Scorpio has a deep, sensual seductive passion. The archer and the scorpion will blend to have a great chemistry. They will be attracted to each other in a way that is hard to resist. However, when the Sagittarius is dating Scorpio can both be temperamental. They will have a physical intensity that is strong, but it might not be enough to sustain the relationship. They will both have to have a deeper understanding of each other if they want a successful relationship. Sagittarius is a Mutable sign. Scorpio is a Fixed sign. They will both be very good at multitasking. They will both be able to keep each other’s interests in mind, and remember birthdays and special events with family obligations. Scorpio will be the one to finish things. They can stick to projects and finish them. Sagittarius likes to jump from project to project and lose interest. They will definitely notice all the work their Scorpio partner does. They will be more than happy to show their appreciation when they know it is needed. Scorpio men or Scorpio women can be somewhat of a perfectionist. They are stubborn and demanding. They will need to give the Sagittarian the space and time for their own interests. The scorpion will be able to make the archer’s ideas a reality, even if they have moved on to another project and are not interested. However, Sagittarius and Scorpio in love do not work all the time. Sagittarius is flexible. This is a positive trait of the Sagittarius compatibility that will win over stubborn determination. In this Sagittarius Scorpio love compatibility, the scorpion can be clingy. Sagittarius will enjoy their independence. They might have some trouble if the Scorpion tries to push the archer into making some kind of commitment. The more the sorcerer will try to control the adventurer the more they will have trouble. The Scorpio will not be the one to give in. They will not understand the subtle message of back away. They will need to learn to lighten up. They will need to give the Sagittarius sun sign the freedom they need. If they can do this then their lover might stay on their own instead of having to be forced into it. Sagittarius will find the Scorpio born enigmatic and captivating. The archer and the scorpion can have a successful relationship. They will both need to recognize when they are wrong. Scorpio will be stubborn and less likely to change than their partner. They are more reserved. They would rather be at home, turning on their power and controlling and directing the Sagittarius Scorpio marriage. The archer is outgoing. They love to be out of the house, making new friends and socializing. This can cause trouble if they do not discuss it. At the same time, when they begin to disagree, the situation will be more complicated. The scorpion does not like to show their feelings. The archer will be very open about what they are feeling. Sagittarius is open and honest. They will likely become tired of Scorpio hiding their emotions. They do not have a lot of patience. They might decide to move on to a partner that is more open and breakup this Sagittarius Scorpio love compatibility. The Sagittarius star sign will see every day as a new adventure. Scorpio will see every day as a compelling mystery. They will both see them as endless opportunities to explore and probe, and to learn something new. The adventures they have together will bring them closer together. The archer will not like the scorpion being stubborn and having a lack of flexibility. At the same time, the scorpion might think the archer is too temperamental. They will both like learning new things together. Traveling can benefit both of them. The Sagittarius Scorpio compatibility in this relationship is always full of life. Sagittarius and Scorpio in love will be more compatible if they are trying to work hard and solve their troubles together. Sagittarius will need to learn to give Scorpio the time and space they need to answer questions. They will both need to show each other understanding and agree to work together instead of against each other.